Friends For Life supporters and their pups gathered for a holiday party at Langford Market in the Heights. With their four-legged friends by their side, ladies shopped Langford Market’s collection of carefully chosen, classically feminine clothing, accessories, furniture and gifts. 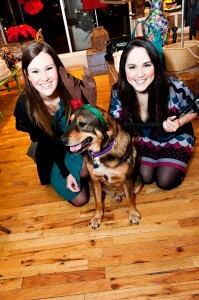 A Friends For Life adoptable dog, Sammy, donned reindeer antlers and gave under the mistletoe smooches for a $1 donation. Poinsettia cocktails (cranberry, champagne and cider) and mini Frosted Betty cupcakes sweetened the party. A raffle got tails waging to win a tote bag filled with goodies from the boutique and Friends For Life. Ten percent of proceeds benefitted Friends For Life’s mission of offering No Kill solutions to the animals of Houston. ABOUT FFL: Friends For Life, Houston’s fastest growing No Kill animal adoption and rescue organization, is dedicated to offering No Kill solutions to the animals of Houston and the people who want to help them. Programs include rescue, rehabilitation, adoption, humane education and animal food/supply support. A dynamic non-profit made up of people of all backgrounds and professions including veterinarians, lawyers, business people, architects, physicians, educators and trained shelter staff, Friends For Life is committed to offering Houston a real alternative to shelters that kill homeless animals. For more information, call 713.863.9835 or visit www.nokil1.org.